Baby Pebbles: Full of firsts! This week has been momentous! Nearly every day Penny has done something new or had a first of something. It's been really over whelming for me and I've spent most of this week crying happy tears over my beautiful little girl growing up. 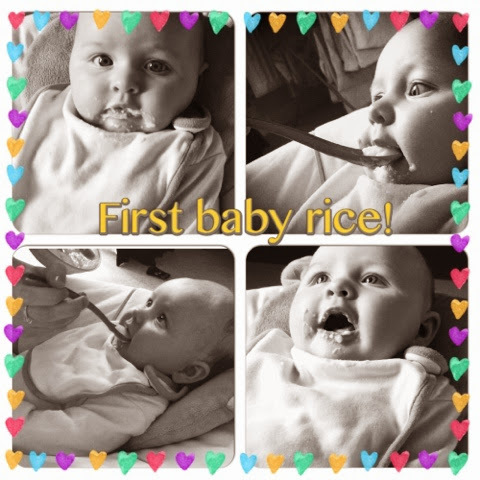 So firstly she had her first few spoons of baby rice! She absolutely loved it and seems to be a lot happier after she's had the rice. I'm glad I started her a little earlier than 4 months as her formula just wasn't cutting it. She's happier and I'm happy knowing that! Her first reaction was priceless her face dropped and she wouldn't closed her mouth. She sat there with her mouth open like 'yuck! What have you just done mum get it out' but once she got a little taste she perked up to the idea. After a few spoons she was opening her mouth for more and swallowing the majority that was on each spoon. It was a messy scene haha! 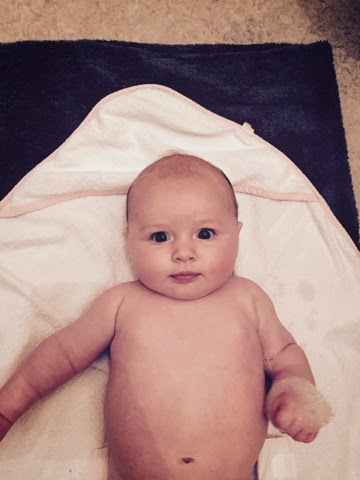 She had her first ever bath with mummy! I could absolutely kick myself for not doing this alot sooner. I was just always making excuses as I was to nervous about the idea and thought she was way to delicate. I felt that finally now was a good time to give it ago so I dived into the bath and got my other half to help us. It was such an experience, it made me feel so close to her. She seemed to really enjoy it too and was smiling the world away! 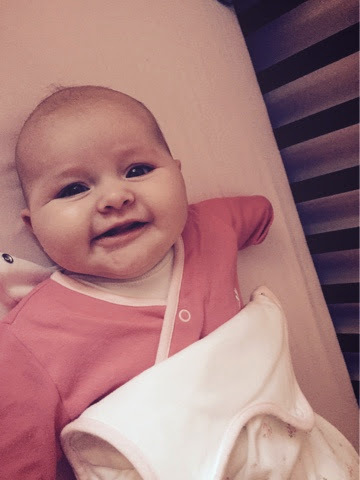 She had her first giggle! It was also bath related...actually it was the day after the first try. I decided to bath with her again as we both enjoyed it so much. Daddy was playing with Penny and her ducks as she loves them and finds them fascinating. He was squeezing another toy and it made a high pitched noise. I'm sure she thought it was the ducks making the noise, she was staring at them like crazy. All of a sudden we heard this giggle! She was absolutely laughing her head off. And she just couldn't stop haha! It was the cutest moment in the world. I felt such a warmth inside it was so special. A moment shared with mummy and daddy! ...But we didn't video or take any pictures unfortunately. It was the last thing on my mind! I'm also leaving Penny for the night tomorrow for the first time. Reese is taking me to Thorpe park fright night and we're staying away the night in hotel! I'm dreading leaving her and have been soooo emotional thinking about it. I hope she has a lovely time with her nana and I have to remember she's in safe hands. And lastly she had her first baby group experience. She laid in the blanket with all different sensory bits and absolutely loved it. She pulled all different materials into her hand and ending up basically burying herself in it all. As I sat there watching her wriggle around so happily I thought to myself this is something we should do alot more. So I'm going to start going regularly!